NORTHRIDGE, California - The five-star Radisson BLU Hotel, located in Tunisia, recently completed a full upgrade of their audio system to coincide with a comprehensive renovation. Local HARMAN distributor MediaCom SA designed a system including JBL, Crown, and BSS Audio components with the installation handled by local contractor, DAT. Situated on the resort island of Djerba, the luxury hotel's upgrades include new bars, restaurants, conference rooms and a spa. For sound reinforcement MediaCom SA chose JBL Control 24CT loudspeakers, the Control 19CS 8" ceiling bass driver, as well as Control 25AV surface-mount speakers. Four of the conference rooms were equipped with the JBL Control 200 series, favoring the ultra-wide ceiling speaker coverage from the 6.5" coaxial drivers. Control 226C's, with integrated back can, were featured in the hotel's conference room. Control 227C's were deployed in the remaining rooms. 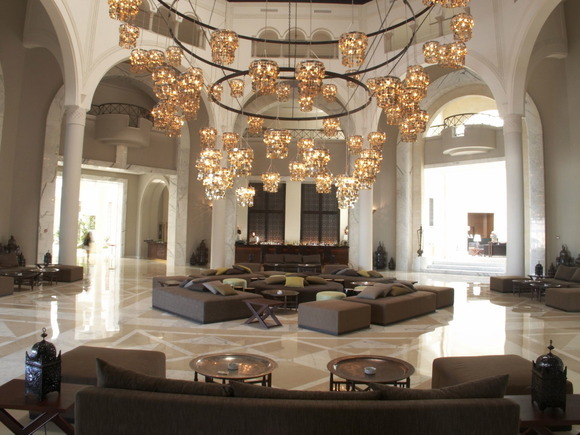 The lobby, spa, and pool areas also utilized the Control 226C's. The JBL speakers were assigned to a combination of six Crown CTs 8200A and two Crown CTs 4200A amplifiers. This system was networked with HARMAN HiQnet System Architect(tm), which allowed the amplifiers to deliver comprehensive monitoring and control functionality along with digital audio transport. Additionally, all signal processing in the new areas of the hotel is handled by BSS Audio Soundweb London devices. Commenting on the system MediaCom chairman, Ridha Ourzli stated, "This audio solution provides great ease of use for the technical staff, the hotel's technical engineer can receive full system feedback and diagnostics on the networked audio system from his computer." Ourzli added that since DAT are regular customers of HARMAN brands, their familiarity with the systems made the integration straightforward. "The client is delighted, and extremely satisfied with the solution we have provided."